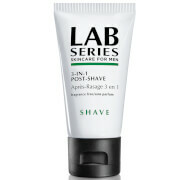 Treat freshly shaven skin to the Lab Series Skincare for Men 3-in-1 Post-Shave Treatment; a triple-action formula that absorbs quickly to restore a smooth, fresh complexion. Infused with a cocktail of beneficial ingredients, including Caffeine and Peppermint, the lightweight gel soothes irritation and razor bumps for long-lasting comfort. Helps to improve skin texture and minimize ingrowing hairs by supporting the natural exfoliation process. 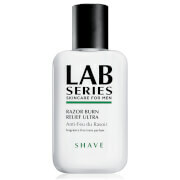 It refines beard hair over time for less frequent shaves. Apply after your morning shave, and at night before bed. Water\Aqua\Eau, Cyclopentasiloxane, Butylene Glycol, Acetyl Glucosamine, Dimethicone, Glycerin, Serenoa Serrulata (Saw Palmetto) Fruit Extract, Saccharomyces Lysate Extract, Polygonum Cuspidatum Root Extract, Laminaria Saccharina Extract, Sea Whip Extract, Menthol, Boswellia Serrata Extract, Mentha Piperita (Peppermint), Castanea Sativa (Chestnut) Seed Extract, Sodium Ursolate, Acrylates/C10-30 Alkyl Acrylate Crosspolymer, Phytosphingosine, Caffeine, Ethylhexylglycerin, Sucrose, Sorbitol, Oleth-10, Dimethiconol, Caprylyl Glycol, Ammonium Acryloyldimethyltaurate/Vp Copolymer, Carbomer, Hexylene Glycol, Tromethamine, Disodium Edta, Potassium Sorbate, Bht, Phenoxyethanol, Yellow 6 (Ci 15985), Blue 1 (Ci 42090), Red 4 (Ci 14700).